I'm not sure where I originally found this recipe. I cut it out of a magazine or something, and it's been in my recipe collection for ages. Here's a copy of the original recipe I found over on Food.com. Of course, I didn't follow the recipe, exactly, but I think that's part of the appeal of a recipe like this - you can substitute the ingredients you have on hand. I didn't have any cherry tomatoes, but I did have one Roma - and a red pepper for some color. I also added some sliced onion, because everything needs onions! 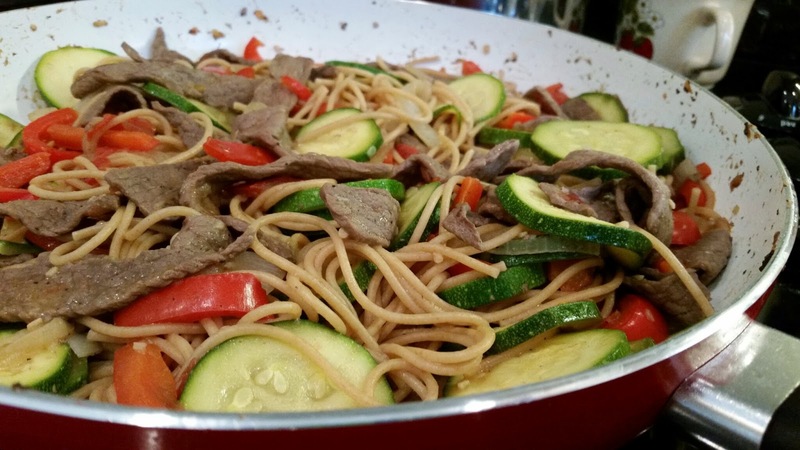 While spaghetti is cooking, heat oil in skillet; add beef and stir fry until partially cooked, 2-3 minutes. Add garlic, onion, and bell pepper and stir fry another couple minutes before adding zucchini. 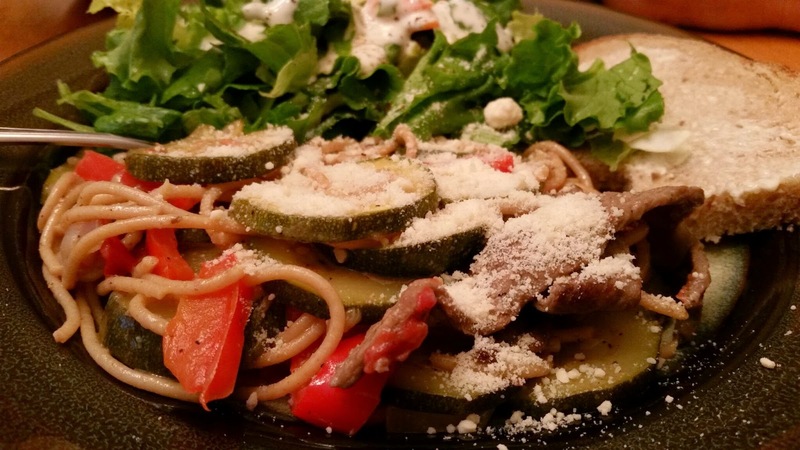 When zucchini is crisp tender, season with salt and pepper and then add Italian dressing and diced tomato. Heat through. When spaghetti is cooked, add a ladle of the cooking water to skillet and set aside a little more (1/2 cup to a cup) Drain spaghetti and add it to the skillet; mix it in and heat for a couple minutes to let everything combine. I used whole wheat spaghetti, which was just perfect in this, but you can use regular spaghetti too. A green bell pepper will work in this, too if that's what you have. It's a simple recipe with a lot of flavor, and you can adjust it to suit your tastes or to use the items you have in your kitchen. Even the leftovers are good! This is where the reserved pasta sauce comes in - add it to your leftovers before refrigerating them. Pasta tends to soak up extra moisture. If you don't add the pasta water now, you will find you need to add water when you reheat, so you might as well use the good pasta water. I've heard that there are people who won't eat leftovers, but if you liked it the first time, wouldn't you like it a couple days later? Sometimes it's even better reheated because the flavors have had time to blend and improve. But that's another topic. Just try this recipe. You'll like it. Oh, and if you have lots of zucchini you're trying to figure out what to do with, try this first and then pass the rest to me. I actually had to buy the zucchini I used in this recipe because I don't have a garden again this year, which makes me very sad. Hard to believe when I was growing up I said I didn't want to have a garden when I grew up!